To mark Lama Jampa Thaye's birthday on 23 October, pujas were performed at Tegchen Legshey Ling monastery in Nepal and in a number of our Dharma Centres. 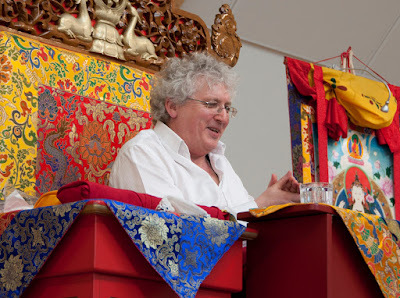 Lama Jampa, himself, is currently in Los Angeles bestowing teachings on the Madhyamaka View and the Initiation of Manjushri. The sangha at Tegchen Legshey Ling monastery in Nepal gathered to perform a long-life ritual and 'tsok' offering. Special tormas were prepared, and the ritual to the Buddha of Long Life, Tsepame was performed to remove all obstacles and maintain the auspicious circumstances of a long life; this was followed by a Ganachakra feast for accumulation of merit and receiving blessings, followed by extensive prayers for the sharing of merit and wishes for the happiness of all beings. Offerings were also made in Lama Jampa's name for the decoration of the great 'Bya-rung kha-shor' Stupa at Boudhanath. The enormous merits of maintaining and beautifying such a symbol of the indestructible Buddha-mind were dedicated to the continuing long life, good health and prosperity of our precious Dharma teachers. Sanghas in a number of Dharma Centres recited pujas and long-life prayers, including White Tara Chintamanichakra (at Sakya Dechen Ling), Gonkar (at Sakya Thinley Rinchen Ling) and Guru Rinpoche (at Kagyu Ling). All the different sanghas rejoiced in the merit of these practices and dedicated the merit to Lama Jampa's long life and good health.